The Team Saskatchewan Wheelchair team was selected by the team’s head coach Lorraine Arguin & assistant coach Lloyd Thiele. 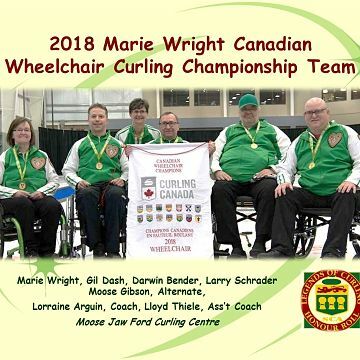 Marie Wright (Moose Jaw), Gil Dash (Wolseley), Darwin Bender (White City), Larry Schrader (Regina), Moose Gibson (Moose Jaw) Lorraine Arguin (Head Coach), & Lloyd Thiele (Assistant Coach) represented Saskatchewan at the 2018 Canadian Wheelchair Curling Championship, which was held Mar. 26 – Apr. 1 in Leduc, Alberta! 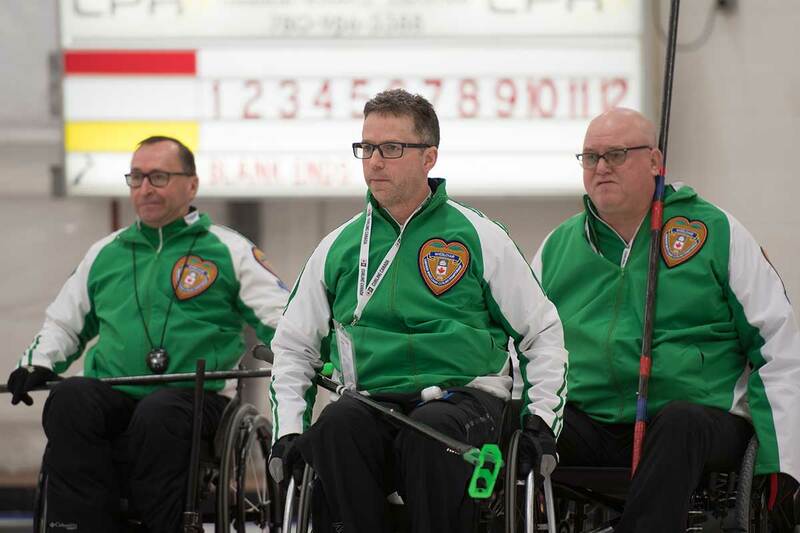 Team Saskatchewan is back on top as national champions after claiming the 2018 Canadian Wheelchair Curling Championship Sunday afternoon in Leduc, with a convincing 11-1 victory over Manitoba! Marie Wright (skip), Gil Dash (third), Darwin Bender (second), Larry Schrader (lead), Moose Gibson (alternate) & Lorraine Arguin (Coach) have earned their third Canadian championship in the past seven years. With their most recent win on home soil at the Regina Callie Curling Club back in 2016! This year’s team made a slight line-up change moving Marie Wright up to the skip position for the first time, and it paid off tremendously as the team went undefeated all week (11-0) outscoring their opponents 90-32! What an amazing accomplishment for Team Saskatchewan! For Marie Wright, this will be her second medal on the world stage in the past few months, as she brought home a bronze medal along with fellow Saskatchewan coach Wayne Kiel, at the 2018 Paralympic Winter Games as part of the Canadian Wheelchair Curling Team! The team consisted of Mark Ideson (London, ON), Ina Forrest (Vernon, B.C. ), Dennis Thiessen (Stanford, MB) & Alternate Jamie Anseeuw (Oak Bluff, MB).